UCI Lightpath is composed of a Science DMZ with a 10 Gbps connection to the science and research community on the Internet, and a dedicated 10 Gbps network infrastructure on campus. A science DMZ is a portion of the network that is designed so that the equipment, configuration, and security policies are optimized for high-performance scientific applications rather than for general-purpose business systems or “enterprise” computing. The initial infrastructure covers eight campus locations including the OIT Data Center where computing clusters, such as HPC and Greenplanet reside. 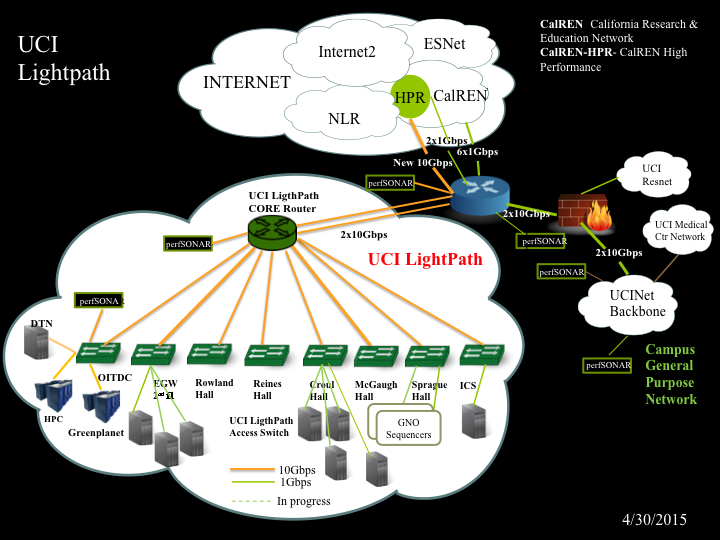 The UCI Lightpath network infrastructure is separate from the existing campus network (UCINet.) The diagram shows the current status of the UCI Lightpath. OIT recently improved UCI’s connection to the Internet, increasing bandwidth from 6 Gbps (billion bits per second) to 20 Gbps. This upgrade enhances connections from the main campus, UCI Medical Center, and the residential network. The upgrade provides faster network access both to the research Internet and the general commodity Internet. UCI connects to the Internet via CENIC, a regional network service provider providing Internet connections to California research and education organizations. CENIC provides two connections for the campus: CalREN-HPR and CalREN. CalREN-HPR supplies researchers with high-speed connectivity to other research networks, such as Internet2 and the Energy Science Network (ESnet). CalREN provides general Internet commodity services. Last July, when OIT began work on the UCI Lightpath project, our CalREN-HPR network connection was upgraded from 1Gbps to 10Gbps with a 1Gbps diversified backup link. (Lightpath is a dedicated science network funded by the National Science Foundation). This February, our CalREN general Internet connection was upgraded from five 1Gbps connections to a 10Gbps connection. OIT is also working with CENIC to establish additional fiber infrastructure between UCI and UCLA which will enable us to upgrade our diversified backup paths from 1Gbps to higher bandwidth. Our goal is to upgrade both backup links of CalREN-HPR and CalREN to 10Gbps in the near future.